I’ve always loved to cook. My stove gets a daily workout, my recipe books number in the hundreds, and I have so many pots, dishes and kitchen gadgets that I rotate them in and out of storage. With enthusiasm comes a price, however: an unruly mess that somehow has overtaken every flat surface by the time I untie my apron. I’m not sure I could tell you exactly when the jumble hits critical mass, but I do know it’s something that happens to the best of us. These ideas are tailor made for the messily inclined. 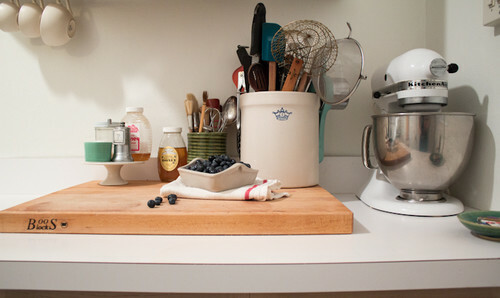 What’s your suggestion for keeping a kitchen neat? 1. Block the view. If you can’t avoid making a mess while you cook, you can at least shield it from guests. A two-tier island or peninsula, with the back higher than the front, screens flotsam from those seated opposite the cook. 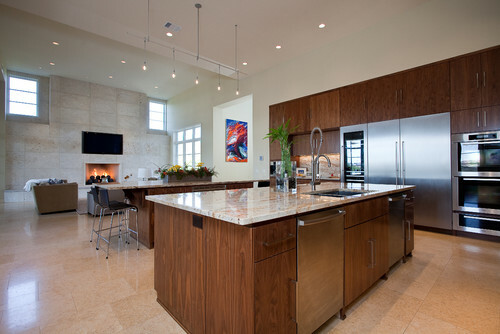 This island has more height than some, so if the owners add a few bar stools that aren’t too tall, guests would be hard pressed to glimpse more than a sliver of mess. 2. Build in trash receptacles. 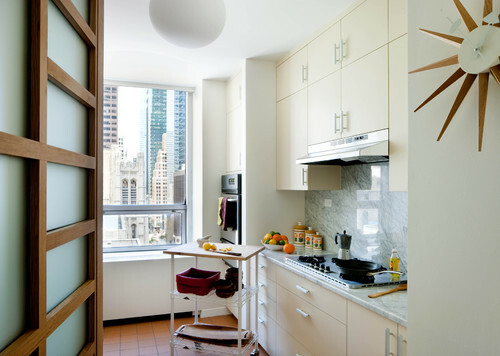 I’m a little squeamish about keeping a trash can right in my kitchen (yes, I know people do it all the time). So mine stays in the garage, and I gather trash and food scraps in a small grocery bag that I carry outside when I’m done cooking. It’s not the most efficient or attractive solution, I freely admit. 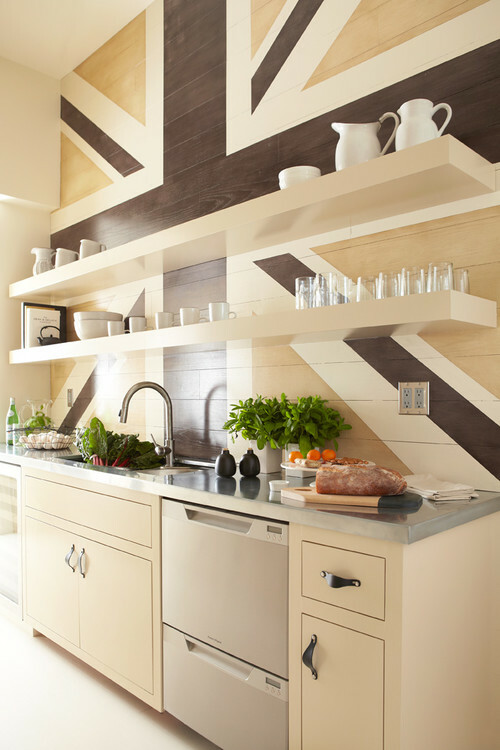 But bins like these, built right into the cabinetry, could change my mind. Having a spot where you can sweep away waste and compost as you go is a huge part of keeping counters tidy, and built-in bins sure look better than my stash of plastic bags from Target. 3. Choose an extra-large sink. As cooking progresses, dirty dishes mount. 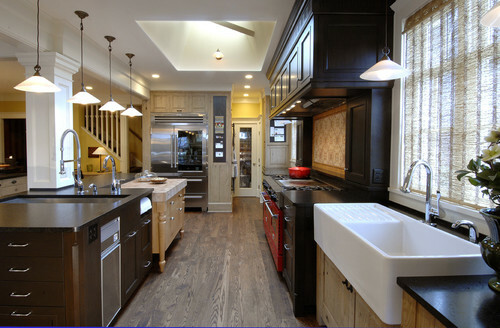 An oversize sink can corral them and keep them below eye level. Apron-front and single-bowl models work especially well. If you like the industrial look, you could even choose a freestanding, stainless steel restaurant-style sink. 4. Build in a prep sink. 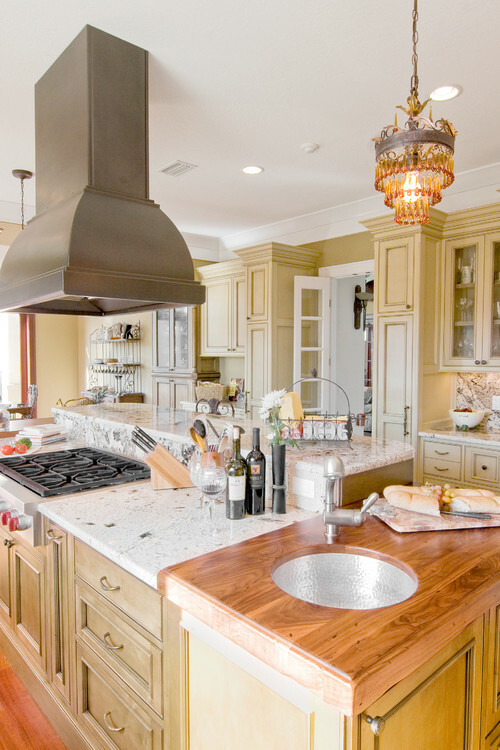 If your kitchen has the space, try a dedicated prep sink to keep eggshells, vegetable peelings and more out of the main cooking area. 5. Add baskets galore. When I’m making a meal, jars and boxes don’t always get returned to their proper homes right away. 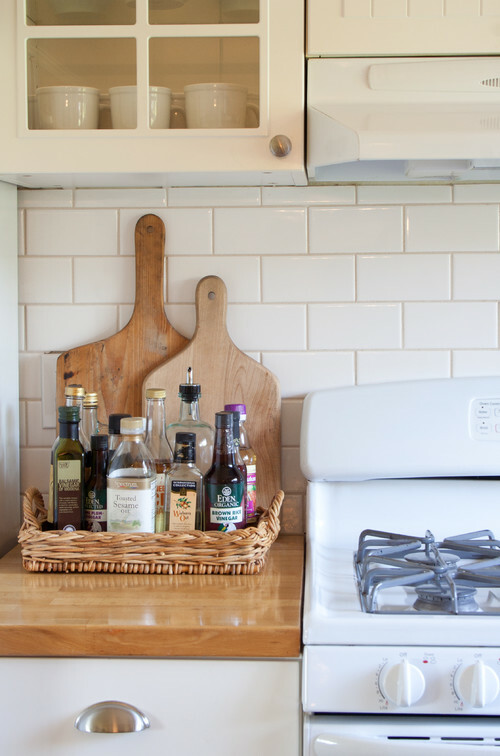 Having a row of baskets to toss things into helps to keep the kitchen neat. 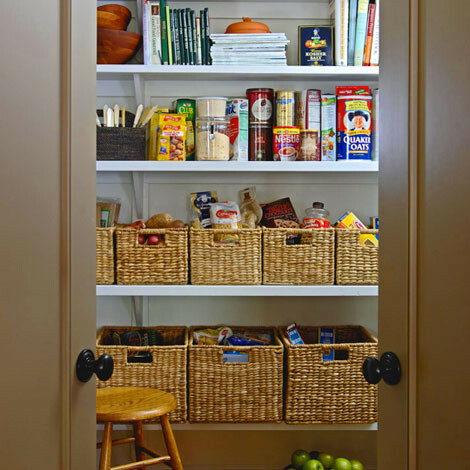 These are in a full pantry, but you can use the same tactic on open counter space, or on built-in or freestanding shelves. Similarly, a shallow basket right near the work area keeps staples from migrating all over the kitchen. 6. Store utensils in crocks. Not only do crocks keep wooden spoons, tongs and spatulas tidy, but they also keep tools close at hand so they’re a cinch to grab when you need them. 7. Double up on dishwashers. Ample dishwasher space means you can tuck dirty dishes in as you go (or, if you’re like me, try to remember to do it). In a pinch you can also keep a cooler full of hot, sudsy water near the sink when you’re cooking a major meal. 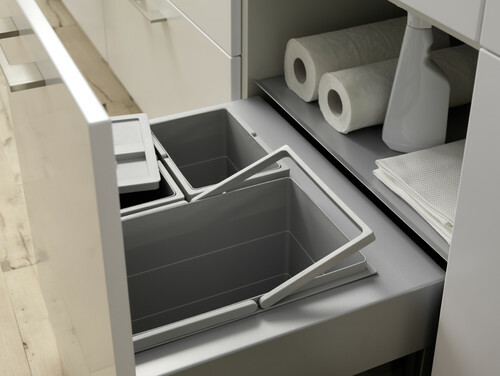 Modular and flexible, dishwasher drawers work well near the main sink or prep sink. 8. Slip in a portable island. As in my case, messy cooks often lack enough counter space for spreading out. 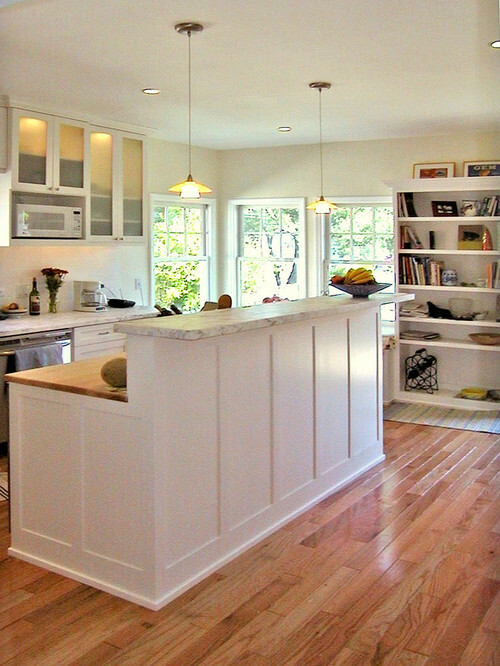 A small island on casters can be amazingly effective at extending the work area. Why haven’t I tried this yet?